Graston Technique is a popular treatment for muscle, tendon, ligament, and soft tissue injuries. It is very effective at speeding healing and recovery, in both acute and chronic injuries. It is one of the most well-known manual therapy approaches that utilizes instruments or tools. Graston Technique is utilized in many professional, Olympic, and collegiate sports therapy programs. Specifically-designed stainless steel instruments have rounded, concave and convex edges. The edges are not sharp. Graston tools are classified under Instrument Assisted Soft Tissue Mobilization (IASTM) and are used to detect and effectively treat soft tissue fibrosis or chronic inflammation. With these instruments the practitioner can scan over and detect areas of fibrotic tissue. There are six different Graston tools to help break up fascial restrictions or scar tissue that develops after trauma to muscles, ligaments, tendons, or fascia, which is commonly referred to as soft tissue. Scar tissue forms when tissue does not heal correctly, or is under chronic, repetitive stress. Scar tissue is weaker than normal muscle and connective tissue, which is why it becomes chronically sore with activity. What is Scar Tissue and Fascial Adhesion? Scar tissue accumulates in the body whenever tissue undergoes excessive stress and strain. Scar tissue is like the body's duct tape; it is meant as a short term patch to help support tissue. However, in some cases the scar tissue is not replaced with normal collagen fibers. 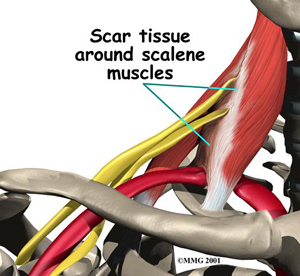 Scar tissue is also referred to as fascial adhesions, as it causes restrictions between the body's fascia. Stiffness, loss of normal range of motion and chronic pain develops from patches of fascial adhesions. The next time a scar tissue patch undergoes stress and strain it becomes aggravated and flares up. This process causes more scar tissue to be added to the outside of the patch and the process repeats itself over and over, leading to larger accumulation of scar tissue patches. I like to describe scar tissue patches as "onions." Scar tissue ends up growing in layers around the initial injury. Stress to the area aggravates the outside layers and triggers another layer to be formed. The layers further from the center are easier to aggravate than the inside layers, which is why the onion continues to grow in size without causing the inside area to properly repair. Home therapies are recommended to limit further scar tissue formation, encourage proper healing and speed up recovery. Braces and supports may be recommended for specific injuries. Graston Technique works by stretching the outer layer of the "onion" and breaking it into several pieces. The Graston instruments use shear force to pull the top fascial layer across the bottom fascial layer. This pulling motion breaks up the scar tissue between the layers. The broken scar tissue triggers healing mechanisms to migrate into the tissue and properly repair the muscles and soft tissues. Ice therapy helps limit additional scar tissue formation, inflammation, and pain. The next office visits breaks up the next layer of scar tissue, working toward the center of the onion. The goal is to get to the center of the onion so the body can fix the original problem. Many sports therapy chiropractors, physical therapists, doctors, and athletic trainers have been properly trained in how to utilize the Graston tools. Graston Technique is not meant to be painful and should be performed at a comfortably tolerable level to break up scar tissue. Being too aggressive with Graston Technique, Active Release Technique, manual therapy, cross friction therapy, or massage therapy causes excessive pain and actually slows the repair process by flooding the area with inflammation. Treatment usually lasts a few minutes per area or region. As the treatment tool slides across the soft tissue fibrotic areas, the injury may feel bumpy or sandpaper-like. Redness and mild swelling may develop with treatment, especially after the first few treatments. In some cases, small petechiae or bruises may develop post-treatment. Ice therapy is commonly utilized post-treatment to limit the bruising, pain, and inflammation. Most people notice a significant difference after 4-6 visits. Severe cases of neck pain, back pain, shoulder tendinitis, medial epicondylitis, lateral epicondylitis, carpal tunnel, knee pain, Achilles tendonitis, and plantar fasciitis have improved with Graston Technique. Runners, triathletes, and weekend warrior athletes have all benefited from this therapy. Over the course of treatment, most patients notice that less bumpiness, sandpaper, and tenderness is felt around the injury. As the treatment progresses, your healthcare provider will be able to apply more pressure, thereby treating deeper and deeper tissue levels. Soft tissue injuries are improved with Graston Technique strengthening programs, endurance exercises, proprioceptive activities, ice, rest, and modification of activity. Clinical research studies have shown the benefit of Graston Technique when combined with functional rehabilitation, sports physicians, chiropractic, physical therapy, and massage therapy. Dry needling, cortisone injections, cold laser therapy, acupuncture, NSAIDs, and additional prescription medication may be used in conjunction with Graston Technique to enhance your recovery. Chiropractic care enhances joint motion, especially in spinal, neck, and back injuries. In the long run, improving health and function requires strengthening the weakened tissue, removing excessive stress, increasing efficiency, and eliminating the factors the caused scar tissue to develop. Proper training plans and rehabilitative exercises prevent future injuries. Combining multiple types of treatments enhances effectiveness while reducing future injury risks. Functional and Kinetic Treatment in Rehab, FAKTR, is a treatment philosophy that emphasizes breaking up scar tissue and looking at the rest of the kinetic chain. Many injuries are the result of muscle, strength, or flexibility dysfunction in the kinetic chain, which leads to stress overwhelming the soft tissue. After breaking up fascial adhesions, rehabilitation and therapy provides specific exercises, stretches, proprioception, or taping to restore proper functional mechanics. Trauma Sudden accident. Types of injuries like stepping off a curb or falling off a ladder. Repetitive Motion Injury Same motion over and over. Improper Mechanics Slouching at a computer makes muscles work harder to hold up your head, neck, and shoulders. Aging Years of wear and tear on the body adds up. Scar tissue forms when the body lays down bad fibers. These bad fibers occur with any of the body's healing processes. However, with continuous and repetitive stress, scar tissue accumulates and becomes problematic. Some scar tissue forms between muscles everyday, but normal stretching and movement breaks it up. When scar tissue can permanently accumulate it creates fascial adhesions or "patches" that don't function like normal muscle or tendons. View scar tissue in a video from Dr. Gil Hedley. When scar tissue limits movement it can contribute to many injuries or conditions, including headaches, shin splints, nerve entrapments, back pain, sciatica, sacroiliac or back pain. It can also "grab and fish hook the nerves," such as in thoracic outlet syndrome, carpal tunnel, or ulnar tunnel syndrome. In some cases the pain nerves get caught in the scar tissue patches, producing frequent pain. With headaches, large patches of scar tissue accumulate in the trapezius, levator, and cervical paraspinal muscles. These are the "knots that never go away" or "the spots that always get sore first and lead to my headaches." Graston helps to break up scar tissue and triggers the body's normal healing process. The body then properly heals the weak spots back into normal tissue. This restores normal function of the muscle and restores normal tendon strength. In similar fashion, a study on Graston Technique and trigger finger showed significant improvement when the therapy was applied to traditional physical therapy treatments. Muscles are like the licorice pull-and-peels. One fiber is wrapped in a group of fibers called a fascicle. 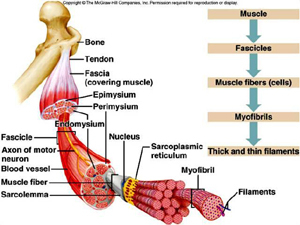 Each fascicle is wrapped in a group of fascicles to form a muscle bundle. All the fibers are wrapped in coverings called fascia. Massage is better at breaking up scar tissue between muscle bundles. Graston is better at breaking scar tissue between fascicle to fascicle. In the end, any scar tissue that limits movement needs to be broken up to restore normal motion. We combine massage therapy and Graston to break up all scar tissue that restricts movement..
Graston Technique, Active Release Technique, ASTYM, and IASTM have all been studied with outstanding results. The research strongly supports these treatments for many types of sports injuries, sprains, strains, and muscle pulls. The www.grastontechnique.com website has numerous articles and published studies on IASTM. Graston Technique has helped advance the field of sports medicine and returned thousands of athletes back to competition. 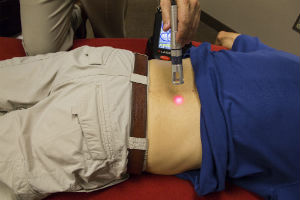 Some professional and elite athletes utilize the techniques as preventive treatments, trying to break up fascial adhesions before they cause pain or injury.